Television changed in the 1960s. 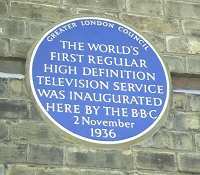 With the growth of nationwide television, broadcasters turned into "programme factories". Even "Auntie BBC" changed. In the mid-1960s there was a complete re-structuring of the management and the BBC was now just another corporate body. In the 1950s, and especially the early 1950s, it was still a pioneering era in television. Quite often, what we were doing hadn't been done before. We were all interested in what was going on around us, and if a piece of new equipment was installed, all the operational people would come and have a look at it. At AP it really was like a family. 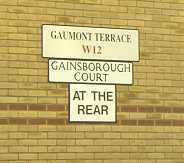 Those days have gone, and those of us who worked there in the "golden days" are getting fewer..... As are the buildings! 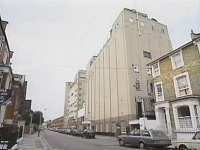 Lime Grove Studios as they were in the 1980s. But if you go there today, you'll find the studios have gone. 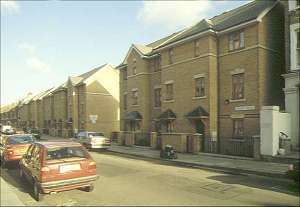 They have been completely demolished, and where they once stood are some modern houses. All that remains are some names recalling it's previous film connections, but, sadly, no mention of BBC Television. Such is progress! 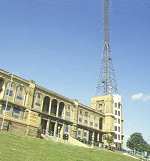 Alexandra Palace, however, is a Grade 2 Listed Building and so provisional plans to cut the mast down to half its height have not been implemented. Also there has been an exciting proposal to turn the "BBC wing" into a Television Museum! That would be worth looking forward to, as there are so many memories locked away in that building, which make it worth preserving. However there is a danger. A Grade 2 listing provides that the exterior of a building may not be altered, thus the interior can be gutted without contravening the listing regulation. And this has been put forward by the owners of the Palace that the interior of the south-east corner, the "BBC wing", would be gutted and turned into a leisure complex and sold for a million pounds. Has anyone got a million pounds in order to prevent this? I hope you've found my reminiscences from the early days of television interesting, a time which looking back, quite honestly I feel privileged to have been even a small part of.